This is the talk page for User:MrLanceVanceDance. Please leave a message. This Talk Page's primary intention is for other users of Grand Theft Wiki to ask wiki and community related questions. Discussions started on this page will be answered/contined on this page as quickly as possible. Questions asked on this page will be responded to on the asking users talk page as quickly as possible. Anything about myths, mods, speculation, fan fiction, unreleased games or nonsense will be ignored and/or removed. Any spam listed on this page will be completely ignored. Swearing will not be permitted and/or tolerated on this talk page. Swearers will be ignored. Remember to sign your posts with 4 ~'s or else I cannot contact and communicate with you. In reply to "Help spread the word"
Tell your friends about GTW - put it on your Facebook/Twitter, mention it on any forums/websites you go on, generally just get the word out. Link to GTW from as many websites as you can - such as your signature on a forum, any editable sites like Wikipedia or IMDB, any sites you own/run etc, even put it on Talk pages on many different wikis. If you want to be really helpful, then you could look at Wikia's Special:RecentChanges, see who is editing that site, and send them a NICE polite message advising them that the community has moved here, and that you'd like the to join us at GrandTheftWiki.com. The new admin at that site is quite harsh, and he won't like it, but it's entirely up to you. You seem to be actively posting rear views of vehicles, but that isn't necessary. Images showing front views of vehicles are often accompanied by links that lead to images depicting alternate views of the same vehicle, because it keeps image clutter down but will still be able to visually cover a vehicle just as well. The same applies for images showing, say, interiors or engines. The only exception is when these alternate images depict a remarkable feature that should be noted in the article (such as the design of a variant of the vehicle). Thumbnail captions entered there do not need to end with a period. The infobox's code does that for you. Judging by your edits, you seem to have realized that. Ensure the thumbnail size given for the lead image is the same. Make sure to check if the lead image is the same as well (Securicar and Enforcer). vehicle_type and body_style could be used carefully. vehicle_type is used to describe the vehicle in general; body_style describes the specific body style of the vehicle, including the number of doors (i.e. For a Cartel Cruiser, vehicle_type = Civilian truck and body_style = 4-door pickup; for an FBI Washington, vehicle_type = Law enforcement car and body_style = 4-door sedan). Both fields must also be used when necessary for completeness; only in rare cases where there isn't enough information could one field be used, in which case only vehicle_type should be used (Police Bike). The top_speed and endurance fields no longer work. They had to be removed because they do not have a lot in the way to explain the vehicle's performance. There is just more to a vehicle than speed and durability only. You seem to have noticed as well. Do specify if a fact is exclusive to a specific game. The Squalo and Predator, for example, do not seat four occupants outside GTA IV. Neither is it known if Securicars are manufactured by Brute outside GTA IV. There is no need to leave additional spacing between the end of the infobox's code and the start of the rest of the article (empty lines between the "}}" and the article introduction). It leave an unsightly gap on top of the article. Disambiguations should be placed above an infobox. They are always positioned above all else in the page for a reason (Police Bike). Don't forget to check for spelling errors and consistency. Mediawiki (the software we run on) isn't really built for access control. Generally speaking, I can give you access to edit entire namespaces only (like Talk:, Template:, Community: etc) rather than individual pages/categories. The Grand Theft Wiki: namespace (called the "project namespace") is for pages about this wiki, it's rules and how we do things. I've deliberately kept this restricted to administrators only. Whilst Inspectors are somewhat staff, their role is not in running the wiki but in helping users and fixing problems. I intend to recruit many more Inspectors in the weeks ahead, and I don't want to have to give them a huge list of what they can and can't change, and then have to check every page in the project namespace for accidental changes in meaning or unauthorised rules being added or removed. There is also some very important stuff, like copyright information, that absolutely must not be altered. It's much simpler to say the Project and MediaWiki namespaces are for administrators only - everything else can be edited by anyone. Those that I trust, respect and who I know can do the job without supervision can be promoted to Administrators, if we require more - then they will have the responsibility for making the wiki run smoothly, and have the ability to alter the project namespace to fix or change things. Only the Managers actually can authorise completely new rules or policy or big changes. Generally speaking, the rules and policy don't change very often, and I don't have a huge list of exactly what administrators can/can't change - they are all very sensible people who I trust not to mess things up. I would not promote someone to administrator unless I knew they could be trusted to be able to change anything but to not change stuff unless they really needed to, and anything they did change would be correct. Inspectors, on the other hand, only have to be trusted with the rollback and move rights, and the staff badge - so a lot more people are eligible to be Inspectors. If there are specific things you know need changing that you don't have permissions to do, just let me know. If there are lots of things on the same page, you could make the edits into a sandbox page and I can then copy-and-paste them into the real page. Your suggestion of including the rules box is interesting. I don't want to come across as a very authoritarian wiki, where following policy is more important than common sense (like the GTA Wikia has become). I don't want the first thing every user sees to be a big red box of "do not" rules. However, a link to the rules would be reasonable. Generally speaking, the vast majority of our users do not break the rules. It is only a very very very small number of individuals who ignore staff and disrespect the entire wiki - and they would usually be told the rules very specifically the first time they broke them. I don't want to frighten and criminalise the vast majority of users who are normal and sensible. Hey, good work on the disambiguation stuff, but there's one small thing that we do differently here. This is going to sound like a HUGE explanation, but I thought I'd try to explain it properly. If there is a title used by several things, such as Grand Theft Auto (which could refer to the series or the first game) or Downtown Police Station, usually there is one thing with is much more common. Most people say GTA to mean the series, so our Grand Theft Auto page is about the series. Since this is much more common than using it to mean GTA 1, we let the series keep that page. This is much better than using a horrible disambiguation page, much better than each page having a horrible bracketed title ("Grand Theft Auto (game)" and "Grand Theft Auto (series)"), and much easier than forcing EVERY link on the wiki to use the long page titles with brackets. Brackets in page names should only be used where ABSOLUTELY necessary, because they are awkward, hard to guess, hard to type, and much less obvious for newer users to figure out (e.g. Do we use capital S for (series)?). In the GTA example, we get around this by having Grand Theft Auto and Grand Theft Auto 1. Even though GTA 1 is technically called "Grand Theft Auto", this way is much more obvious and it's what most people know the game as. For Downtown Police Station, there's only one which is actually called that, the others can all have different names, so the VC one can take prominence. On the other hand, for Downtown (as in the area), none of them are predominantly the "main" one, so that's when we have to have a proper disambiguation page. I won't disclose all the measure we use against spammers in public. They are different people, but we only have one spammer every now and then - not huge torrents of sockpuppets and vandals like the other wiki. But that is because we treat people fairly. GTA Wikia upsets its users by banning them for (almost) no reason, and they come back as vandals. As for a three-strike rule, I don't agree that that's a good method to use, simply because it is far too rigid. Every offence is of a different level of seriousness and a different level of "intent"; whilst every user would respond differently to different actions. A user who registers only to add 1 spam link (not useful/relevant at all) might not cause much damage, but they should be permanently blocked because they show no intention to be an editor. No warnings necessary, because they would make no difference at all. A user who posts good content but also spams a link to his personal website is a very different situation, because they could still be a good editor. They need to be shown what is and isn't allowed, where they can place links, and if they ignore the instructions from staff, then the blocking route should be pursued. We should be fair rather than blocking them straight away, and this should stop them turning into a vandal. In both of these situations, the same offence (1 spam link) has been committed, but very different sets of actions need to be taken. If we were the GTA Wikia, then the way they strictly apply the blocking policy in EVERY situation (even to staff) means they treat good users (who make mistakes, or get carried away, or just don't know all the rules) as vandals and spammers. Also consider a user who was warned for posting 1 spam link 2007, was warned for an edit war in 2010, and now has an argument in 2011. But in between, they have made thousands of good edits. A three-strike rule means we'd have to block them forever, which is ridiculous. You could probably find 3 examples of where a staff member has broken a rule. Then we have to make dozens of exceptions which are open to abuse, saying things like "if they have >100 edits then they are allowed 4 warnings, not 3" etc. That ends up being a ridiculous mess, then we'd end up having to demote/block staff who didn't follow it exactly. That's what's already happened on the GTA Wikia. So this is why I make sure all my administrators are strong enough to make their own decisions based on what will benefit the wiki most, and what is fair for the users. If someone has a decent chance of being (or becoming) a good editor, then we should help them, not ban them for some silly or abritrary reason. Our promotion process is based around staff that can make fair decisions around complex situations, and I've not seen anything I really disagree with for quite a while. Just a reminder, please be mindful of the effects of very visible additions on a page, like images or infoboxes. When adding multiple images, consider the option of using a gallery, or avoid using images that show the same thing. Redundant images or articles that are too cluttered will disinterest readers. As for the location infobox, I'm not really sure if it's a good idea to adding that thing all over those location articles so soon. I've always thought the infobox needs some re-adjusting, and having the infobox linked to too many articles will make complete overhauls tough. Also, please ensure that any lead images that are added into an infobox retain their original image size. And don't forget to avoid leaving spaces between the end of an infobox code/image thumbnail and the start of the main body of article text. People won't take articles that are poorly coded seriously. There is an issue with splitting Express Car Service into an article on the service and an article on the structure. Do we even need to do this? Both articles are essentially explaining the same thing, going back to the problems that come about when creating excessive redundant articles. Secondly, is there any evidence that Washington Beach police station is a police headquarters? 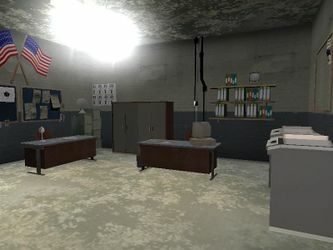 The Downtown police station is arguable larger and better equipped (at least in GTA Vice City); wouldn't logic dictate that building should be a HQ (not that that means that article should be renamed either; I don't know which building is actual the HQ). Scrap that. The in-game HUD says it's the "VCPD HQ" when I enter in GTAVC. Image:Sniper Rifle.jpg: I don't see the player actually moving into cover. It's just the player peering out the corner while covering. Using a sniper rifle while in cover is also very unconventional, especially if players find it necessary use weapons with more rapid firing rates in closer combat. Plus it can simply be explained in the main body of text that the player can fire any firearm while in cover; neither are these screenshots illustrating the player actually blind firing uncoventional weapons while in cover, which would be far more interesting. Image:GTAIV-Cover.jpg: The starting length of the article is too short to support more than two images in both the intro and the succeeding section. When that image was added, Image:CoverSystem-GTAVC-inuse.jpg was already present on top of the article, acting as both a lead image and the corresponding image to the "Pre-GTA IV" section; it also suites the chronological order of illustrating the feature in an earlier game rather than displaying bias towards newer games, because it establishes that the feature goes further back before GTA IV. But by adding GTAIV-Cover.jpg, the images are now stacked unsightly, with both thumbnails bleeding into unrelated sections and pushing CoverSystem-GTAVC-inuse.jpg beyond the start of the "Pre-GTA IV" section. This is exactly the reason I avoid image stacking if they are not sufficiently related (like similarly sized exterior and interior shots) or are unavoidable. A bit of advice. Surely you should be aware that adding redundant images aren't very helpful, but there is also a need to check if an orphaned image was removed from a page for a reason. This can be done by looking into the edit history of a page and verifying if the image was removed with a proper justification. Hey, Mr LVD. There is a user called User:Dan Sug who made some wrong edits. He's a known vandal in Wikia's GTA wiki, and was recently blocked. Not sure what to say about all that reuse of existing images on other articles. Some of the pages you've worked on have ended up being too cluttered with pictures that it looks messy as hell to read. Images that are only remotely related are shoehorned into articles without adding much context. Not only that, image maintenance (i.e. image replacement or renaming) is more time consuming because it facilitates working across multiple pages. This page was last modified on 27 March 2012, at 04:23.